Our mobile self-storage facility is without a doubt the most convenient way to store, well, whatever it is you need to store. These units are used by a huge variety of people from all walks of life. Some people use them for business and keep their stock, paper archives and precious documents; whilst others use them for pleasure and keep golf clubs, bags of football kit, balls nets and goals in an easy to access storage space. 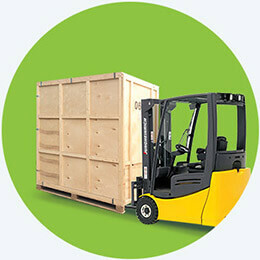 Mobile self-storage to those new to the industry, is an innovative and time-saving storage process. Firstly, you simply call 020 8610 9255 to request your insurable, fully lockable, spacious and mobile storage unit. We’ll promptly deliver it to a location of your choosing and leave it with you for as long as you like. You can simply load up the unit with whatever you need to store, then call us back and we’ll pick it up and deal with rest. No trips to storage facilities, no unloading and reloading, we’ll store the mobile storage room at our secure location, and when you need it back we will deliver it to wherever you need it. You won’t need to leave your home, simply pack up your pod and we do the rest! With our great prices we can be of use in a 1000 different ways so whatever you need us for, just give us a call for a free quotation. 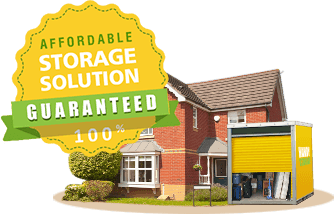 Mobile self-storage saves you time and money and our excellent team have all the experience to make your storage or moving project a success. Storage is exactly what it says on the tin, it is storage that comes to you. When you need it we’ll be round in a flash, and when you’re done we’ll drive it away. No extra unpacking, unloading, loading and reloading. No cramming precious items into a car boot or bouncing around in a removals van. We’ll take great care with your belongings and store them in a clean, dry and secure facility which is fully insured and protected by 24-hour security and CCTV. 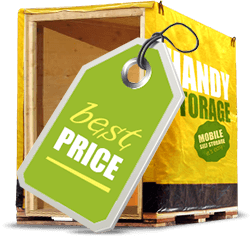 At Handy Mobile Storage we deal with storing a few items that are in the way during a DIY project or building work, to full house moves. Yes that’s right, we can be your removals company too! De-cluttering? You can fit a huge collection of items in one of our spacious mobile storage units and we can give you great advice and help with packing and loading up the storage space so that nothing will be broken or smashed. Our customers have found that this facility is great for all of those items, boxes and general clutter that you don’t want lying around the house, but you don’t want to throw away. Maybe you have some precious childhood memories or lots of Christmas decorations and you just want your house back! No problem, call us now and you’ll be delighted with our prices. We offer very reasonable pricing structures to fit into anybody’s budget, with no hidden fees, add-ons or service charges. The price that you are quoted is the price that you’ll pay, and since our business is based on great service and recommendation we have no interest in exploiting or overcharging. Our offer is simple, we can provide a fantastic and useful service for absolutely any storage requirements for a simple one-off or part-payment- whichever suits you! Mobile storage is exactly what it says on the tin, it is storage that comes to you. When you need it we’ll be round in a flash, and when you’re done we’ll drive it away. No extra unpacking, unloading, loading and reloading. No cramming precious items into a car boot or bouncing around in a removals van. We’ll take great care with your belongings and store them in a clean, dry and secure facility which is fully insured and protected by 24-hour security and CCTV. 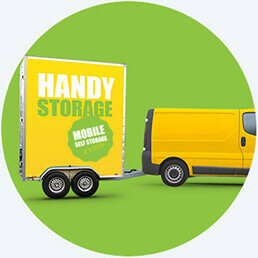 Handy Mobile Storage has built a fantastic reputation because we pride ourselves on the fact that we say exactly what we mean and we mean exactly what we say. That’s why our customers continue to use our service and recommend us to others. Whatever your requirements are we’re the company to talk to, and if you can’t find what you need on our site, or you’re unsure if we will cater for you- give us a call on 020 8610 9255 and we’ll be happy to answer your questions. What can be stored in a cubic yard? Company name: Handy Mobile Storage Ltd. Description: Opt for a mobile storage service from our London storage company and we’ll come to you with a trailer and a storage container that you can fill yourself. Copyright © 2013 - 2015 Handy Mobile Storage Ltd. All rights reserved.